Pope Francis: Human trafficking is a crime against humanity On Monday, in the Clementine Hall in the Vatican, Pope Francis met with participants in the World Day of Prayer and Reflection against Human Trafficking. 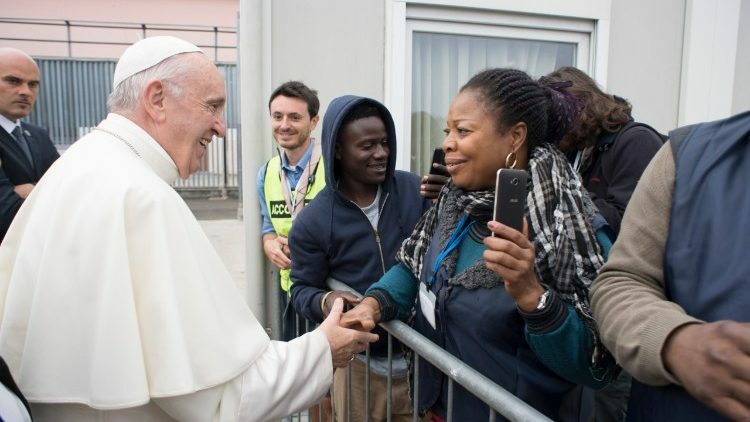 For the first time in the history of the event, Pope Francis met with approximately 110 persons representing survivors, young people, and members of the committee organizing theInternational Day of Prayer and Reflection against Human Trafficking. The theme for this year focused on the role of young people in view of the upcoming Synod of Bishops. Pope Francis fielded four questions from young people. Two came from victims and two came from young people who participated in events prepared for them by the organizational team. The questions from the victims prompted the Pope to point out the problems in society which make modern-day slavery possible: ignorance, unwillingness to admit the issue, and hypocrisy. He underlined several times that he has “never lost an occasion to denounce human trafficking as a crime against humanity.” The Pope took the opportunity to encourage the young people present to “meet with the survivors of human trafficking,” and to learn the signs that someone might be living in slavery. He said that because young people are so open, they might have the courage to say what they see happening around them. Finally, in response to a question regarding whether the voices of young people from the peripheries would be heard at the Synod, he asked them to contact Cardinal Lorenzo Baldisseri: “do me a favor—call him on my behalf—this way you make the work easier," he said. The audience concluded with a prayer to St Josephine Bakhita, the patron of the victims of human trafficking, which Pope Francis prayed together with those present.